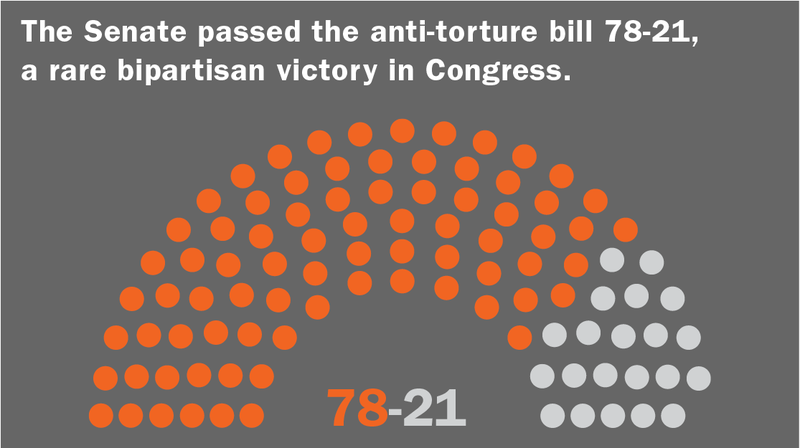 In an overwhelmingly bipartisan vote, Congress strengthened the ban against torture. Learn more about the legislation. In a strong bipartisan vote the U.S. Senate passed a measure solidifying the ban on torture. Seventy-eight senators voted for it, including the chair and ranking members of the defense, intelligence, armed services, and foreign relations committees. It's the law of the land. The broad bipartisan support for this bill signaled that our government was rebuilding the consensus against this illegal and un-American practice.